Discount supermarkets LIDL and ALDI have taken the UK grocery shopping scene by storm. The established big names have wobbled as customers lapped up the low prices and high quality on offer in their the no-frills stores. Wine has played an important role in that, with LIDL employing respected MW, Richard Bampfield, as consultant to quality check and approve their range. Another interesting strategy that LIDL has employed has been to launch limited-edition ranges of wines as special parcels every few months: these selections are slightly ‘geekier’ than the standard range (featuring everything from barrel-aged Albariño, to Gewurztraminer from Italy’s Alto Adige), and often stretch into ‘fine wine’ territory with pricing in the high teens and low 20s. There’s a new Easter collection going into stores on March 30th 2017. 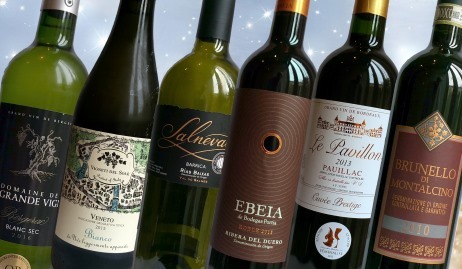 The good news is that the wines will be available in all UK stores, but as always with these parcels the deal is “when it’s gone it’s gone,” so do not hesitate if you want to try any of these wines. LIDL sent me six to try for myself. Note: you can taste a broad range of LIDL wines at my Glasgow and Edinburgh Wine Festivals where LIDL are participating. (2017) In Southwest France the Bergerac appellation neighbours Bordeaux, and much the same grape varieties are planted, making wines in a very similar style. This unoaked white is Sauvignon Blanc, perhaps with a dash of Semillon, that is fresh, fruity and aromatic with a hint of apricot and plenty of dashing, citrus and melon fruit. In the mouth it is rounded and has a really nice balance between that apricot/peach ripeness and the clarity of its lemon and lime acidity. Good value. (2017) An interesting white made using the appassimento technique with partially dried grapes, nothing is given away about the varieties used, but locally think Garganega and perhaps Pinot Bianco. It has a vivacious and tropical character, promising ripeness and sweetness, a little hint of something buttery and minty too. On the palate, there is some sweetness here making it just off-dry, but good acidity does balance. There's texture and ripe, pear and peach fruit in a deliciously drinkable and Chinese food-friendly wine. (2017) What a delicious take on Rias Baixas this is, with the unusual hint of oak from barrel ageing giving a sweet, rounding infill of cream and vanilla - not too much - to the racy, seaside-fresh fruit of classic Albariño. Broader in texture too, there's a nutty apple dryness and lick of salt and lemon pith in the juicy acidity of the finish. Undoubtedly a star of this special collection for me. (2017) This handsomely packaged Ribera del Duero certainly looks like more than £7's worth. A 'Roble', so given only a short period in oak barrels, it is 100% Tempranillo made by Bodegas Portia, owned by Rioja's Faustino, who I visited a few years ago at the opening of their stunning winery. Dark and saturated purple, there's a sheen of cocoa and mocha coffee to dark, glossy black fruit. On the palate a welterweight of black plum, damson and blueberry is bittersweet, with the ripe and creamy fruit set against a firm, spicy framework of tannin and cherry-skin acidity. Not shy on charry oak, but very impressive at this price I must say. (2017) A classic left bank blend of Cabernet Sauvignon, Merlot, and a little Cabernet Franc and Petit Verdot, this opens with a fresh cherry aroma, a little hint of graphite behind, but mostly driven by a ripe, forward fruitiness. In the mouth it is savoury and lean, a sinew of tannin binding the fruit, rounded by some older oak character and a nicely fresh acids. This is a rather tangy, nicely juicy style, not complex, but balanced and would drink beautifully now with rare roast beef or lamb. (2017) Brunello di Montalcino may not be the most famous appellation of Tuscany - Chianti surely takes that crown - but for many Italiophiles it is home to the region's best reds, made from the Sangiovese Grosso variety. What's more, 2010 is generally held as one of the best ever vintages. No producer is stated for this, though a bit of detective work reveals its a respected large producer. There's a balsamic and meat-stocky character, some cedar, four years in barrel plus the bottle age showing as a light tawny on the rim. On the palate the sweet fruit of cherries and a gentle meaty smokiness, soft and giving tannins and good overall balance. It's not a Brunello for the long haul I feel, but delivers good, mature character right now.